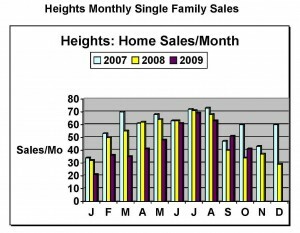 Rich Martin Homes > The Heights & Greater Heights > Heights Price Trends > Houston Home Sales Show Gain…Or Do They? Houston Home Sales Show Gain…Or Do They? Houston Real Estate Market Enjoys Second Consecutive Month of Positive Home Sales Volume. The headline above was quoted from a recent HAR.com press release. Big deal! Those two months were the aftermath of hurricane Ike…they sucked. We were all busy chasing Reliant Energy trucks down the street, begging to get power back on. Then we hunted tree trimmers and roofers. What we were not doing was buying and selling homes! Anyway, here is my chart for Heights home sales. (It is similar to Houston home sales.) It shows it better than just numbers. I keep this on my wall to help with my notoriously poor prognostications on the Inner Loop housing market. It does show the last two months of home sales (the last 2 little red bars) to be better than the Ike months (the little yellow bars). So, I don’t mean to be cynical, I’m happy for any positive news. The first time home buyer’s credit may even help extend this increase for a while. Monthly sales for Sep/Oct were better than last year, but so what? By the way; that tax credit has been extended and even expanded somewhat to help move-up buyers.